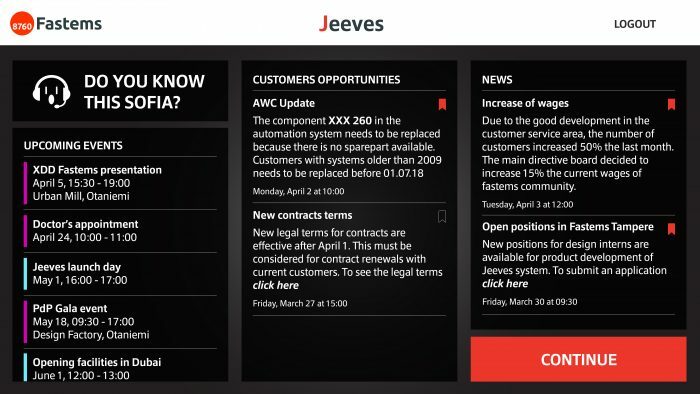 Design a control system that can integrate different sources of data in order to communicate with Fastems employees, so they can utilise this information in a better way to support Fastems’ customers. Intrigued: arouse curiosity or interest of; fascinate. By being actively engaged, users will be able to foresee any arising problems and/or opportunities. Empowered: given the authority and power to do something; to be stronger and more confident. Empathetic: showing an ability to understand and share the feelings of another. The outcome of the project is a graphical user interface prototype based on an ideal story about Service Sales employees at Fastems. Its design was driven by the experience goals established for the project and the insights we gathered through the research and interviews at the company. In addition, after setting the final experience goals, during the design phase we developed in parallel different versions of the story and the related interactive prototype, which were successfully evaluated. Acting as an Intrigue trigger was the “News Dashboard”, which includes meaningful information – events, news and customer opportunities – to arouse proactiveness in the future. To trigger empowerment, we designed a “Personal Dashboard”. Its main purpose is to visually follow your work process, have an overview on the priority task, completed cases, and a calendar for quick scheduling. With this new dashboard, employees gain more control and authority in their work. In the long run, it aids users to build up confidence. The interaction design included “Feedback Mechanisms” for sharing their success cases and providing transparent communication. 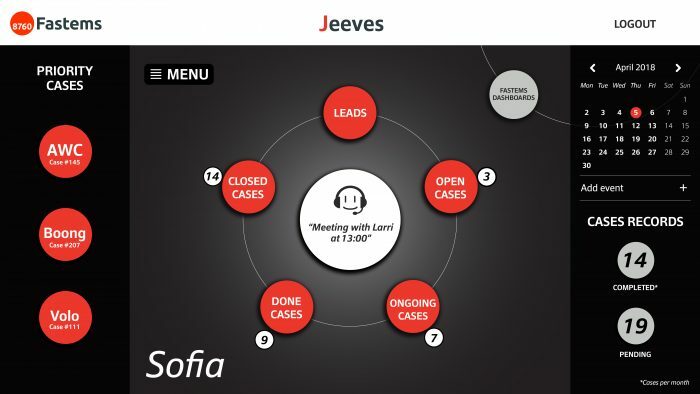 Jeeves helps users and reduces unwanted stress and anxiety and it also develops a sense of trust and belonging.